vice president, an official said Monday. Ridley has been detained as part of a probe, which has seen former DIB vice president Rifat Al Islam Usmani being detained, a police official, who declined to be identified, told Zawya Dow Jones. More than four people are being held so far in connection with the investigation at the largest Islamic lender in the United Arab Emirates, the police official said without giving further details about the identity of the detainees. A spokesperson and officials from Dubai Islamic Bank weren’t immediately available for comment when called Monday. It remains unclear on what grounds Ridley was detained and what’s his relation to the Dubai-based lender. Dubai Islamic Bank shares closed down 0.5% to AED9.09 on the Dubai Financial Market. Ridley’s detention is the latest in a series of financial scandals unfolding in Dubai following the arrest of Zack Shahin, the former chief executive of Deyaar the emirate’s third largest real estate company, on fraud allegations. , according to Zawya.com data. Dubai Islamic Bank Chart Data ‘s rating was cut last month to “neutral” from “buy” at Merrill Lynch & Co., which cited the Deyaar corruption probe and concern over bad loans at the bank. Bahrain-based British banker Charles Ridley has been detained by police in Dubai for almost a week, it has been revealed. The British multi-millionaire met with British Consulate officials on Tuesday. An official later confirmed that Ridley was facing questions, but did not disclose the charges he was facing, Bahrain’s Gulf Daily News reported on Thursday. Ridley’s arrest was believed to be related to investment funds which had put money into petro-chemical developments in Pakistan, the newspaper said, citing an unnamed source. It is believed a Dubai Islamic bank had also invested in the funds. The newspaper also contacted Ridley’s wife who confirmed that British Consulate officials were granted access to her husband. However Ridley is yet to receive access to his legal advisers. 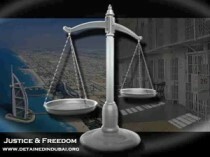 It is believed Ridley’s Bahrain-based business associate Rayan Cornelius has also been detained, the newspaper said. Few details have emerged about Mr Ridley although he briefly made headlines in the UK in 2006 when he held a lavish 50th birthday party for his wife. According to a report in Britain’s Sunday Telegraph newspaper, the rugby-loving banker paid for several world-class international rugby players, including at least two members of England’s World Cup winning squad, to fly to Kenya for the party. A family friend at the time told the the UK’s Sunday Telegraph Ridley had his “own parameters of fun, a different scale”. “He works hard, enjoys life, and pushing the boundaries, and has a significant sense of family and friends,” the friend said. The friend told the newspaper Ridley enjoyed life in Bahrain, where he moored a $3.8 million cruiser at the yacht club. This entry was posted on June 11, 2008 at 00:25	and is filed under Dubai. You can follow any responses to this entry through the RSS 2.0 feed. Both comments and pings are currently closed.